This is with reference to my car booking [number xyz] that I made on [some date]. I'm sorry to inform you that I won't be able to make it due to [some reason], hence I would like to cancel my booking. I apologize for any inconvenience resulting from this decision. I kindly ask you to acknowledge the receiving of my request and to confirm the cancellation of my booking. I really hope to make it some other time should the opportunity arise. I have previously made a booking for a [car name and type] and would like to cancel it due to [state the reason]. My booking number is [car booking number]. Enclosed with this [letter/email] are copied of the booking details and the receipt for your reference. I am not familiar with the cancellation process, so please advise me if I need to fill some form or if there is some other formality. As per your policy, there are no cancellation charges if I cancel [one week] prior to the booking date, so I kindly ask you to refund my deposit in full. Please revert back to me and confirm that my booking has been cancelled. I surely welcome a future opportunity to book one of your cars and I regret that this has happened as much as you do. 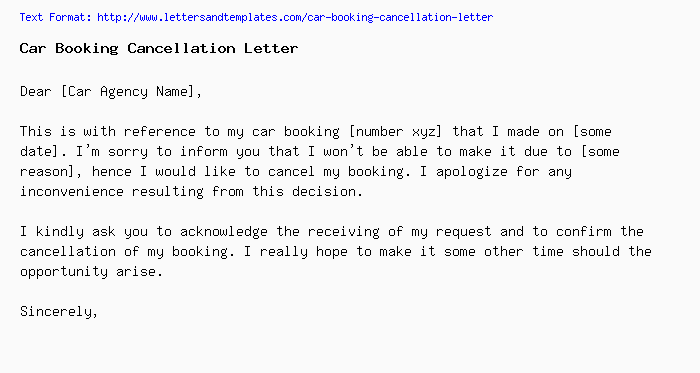 This letter is to inform you that I'm cancelling my car booking on [some date] due to [reason]. My booking number is __________. For your reference, I enclosed a copies of the booking confirmation letter and the receipt. Please refund my advance payment at the earliest and also advise if there are any cancellation charges. I hope this [letter/email] is enough to cancel my booking, otherwise please explain the correct procedure. I appreciate a response from you acknowledging and confirming my request. I apologize for the inconvenience and I hope that I can make next time. I'm sorry to inform you that I'm forced to cancel my booking on [some date] due to [some reason]. I regret any inconvenience this may cause. I really appreciate your understanding. My booking number is ____. Additionally, I enclosed a copy of the booking confirmation that you’ve sent me earlier. Please confirm that you’ve received my cancellation request and have put it in process.